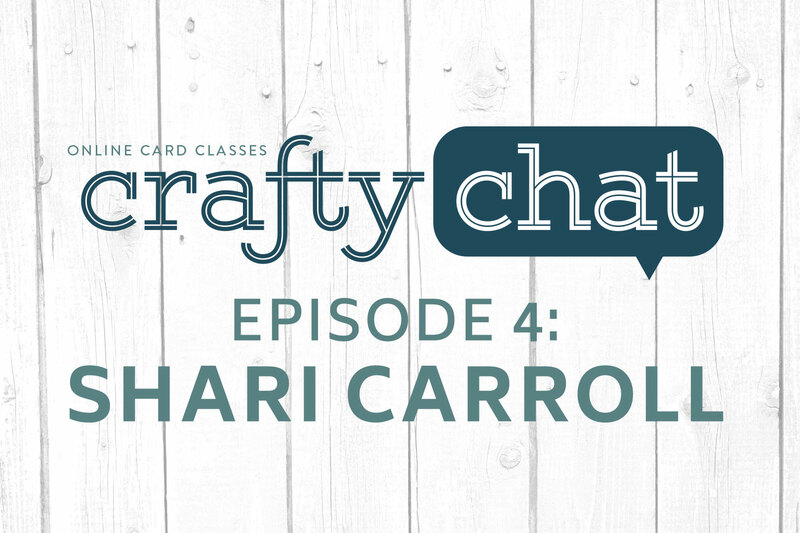 Today’s episode of crafty chat all about one of our favorite topics – color! Our guest is a woman who is never more than a foot away from her Pantone book, and lives and breathes color for a living. Shari was a designer for Hero Arts for 24 years, and is now the Product Manager and Creative Director for Simon Says Stamp. While color selections come naturally to Shari, she shares her approach to color, and how her personal palette evolves over time. It was fun and very informative. Shari showed a Pantone color swatch in the video, and I want to buy one. There seem to be a few kinds for sale. Could you please tell me which one she has, or which one is good for a paper crafter? Also, I would love to take a color pencil class if you hold one! Thank you very much! I had no idea Shari and I shared more than a birthday! By the way I drew by hand in architecture school as well Shari. I miss drawing by hand and building models, which is why I craft. These chats are wonderful. It is so cool to see the actual personalities of the designers that I have grown to love and follow. And, I’ve learned so much. One of the issues I have is getting in a rut. Well, guess what? You all experience that as well. I can’t say enough about this series and all of you. Thank you so much for sharing. The guests as well as the moderators are wonderful. I love you all. I whole-heartedly agree. It is so interesting to listen to the chats between all of you. Makes me feel more a part of the community. Hope you have more of these. Pencil class….sign me up and sorry but all of you are enablers!!! Love you girls. I thoroughly enjoyed the chat, they have all been informative. I would have loved to hear more about collages. Shari, you are the queen of collages, I even have your book. I think that would make a great online card class, too. I also love how you layer things. I took your craftsy class, and enjoyed it. Thanks to all of you ladies for your time, this is a wonderful addition to Online Card classes. Love these chats and love the idea for a colored pencil class. Derwent Inktense pencils are in a class of their own as they have different properties. They are watercolor pencils but can be left dry. However, if you wet them they become permanent once dry so when you go to add another layer you do not reactivate the color beneath. Lindsay Weirich would be a great instructor. She recently did a Craftsy class in mixed media. I know she used to be a hot mess but she is really just so full of knowledge it just bursts out of her sometimes. Her coloring and painting is top notch. Her cards are… different ;-) Also, Prismacolor used to be the gold standard in regular colored pencils but they have recently changed their manufacturing from the USA to Mexico and the quality has dropped noticeably. It is the subject of many message boards and art forums. Thankfully many other brands have hit the market so maybe you can show a variety some of us have an assortment: Spectrum Noir, Tombow Irojiten, or Faber Castell Polychromos to name just a few marketed to crafters. Add the ones marketed to artists and you could have an intermediate class as well if you have the teachers and the interest. I appreciate all that you do!!! I know how time consuming this stuff can be! Thank you! What fun–I would love a colored pencil class! I enjoyed this chat and always love the colors in Shari’s projects. Great fun to listen to the chat, see the friendship and history of your careers! I started stamping through a friend in 1982 so I appreciated your reminiscing about stamping and it’s evolution. Since I’ve retired I’ve gotten back to stamping to create, and experiment. I’ve become obsessed with colors and different color media, so it was fun to hear the chat and hear you warmth,friendship, and history. One thing I’ve really noticed is how important the paper is. Different papers make the color change. There have been many changes in stamping over time. A big vote for a colored pencil class! Thanks for the fun and inspiration your class and blogs bring! I’m really enjoying your conversation. It would be lovely if you would include links or website addresses for the designers and artists you talk about.